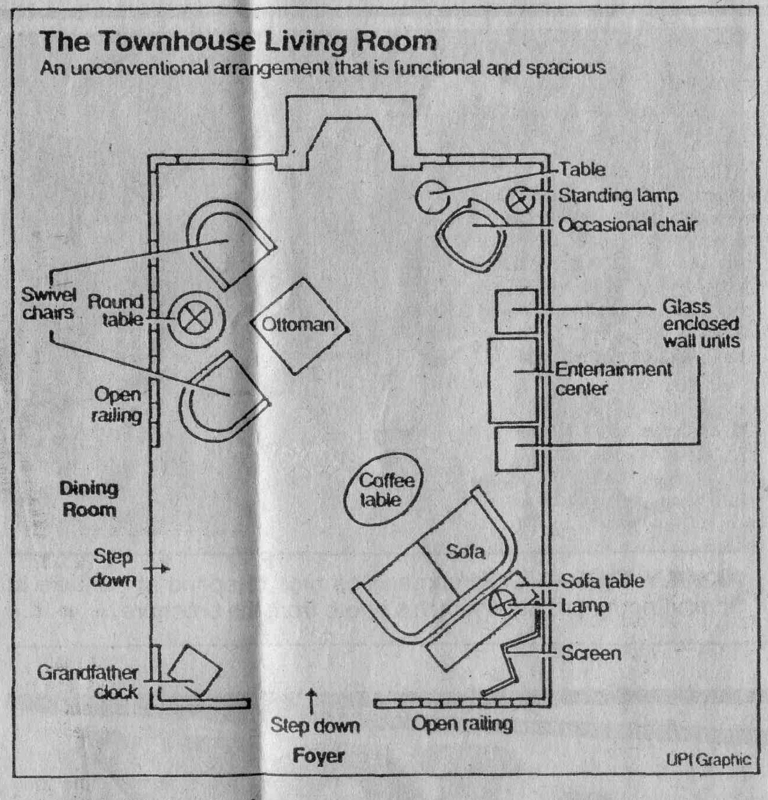 Q: Enclosed is a sketch of the living room in our new townhouse. This is a challenge. I am at a complete loss as to what to do with this room. 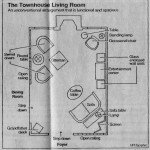 There is only one unbroken wall in the entire space and the rest is either window area, a fireplace or open railings. Since there is no den, it will be used for relaxing and watching televiÂ­sion, as well as entertaining. If I put the TV and stereo compoÂ­nents in an entertainment center on the long wall, which seems to be the only possibility, how would I arrange the remainder of the room? Neither the windows that are close to the floor, nor the railings, can be blocked with a large piece of furniture without deÂ­stroying the spacious look. We need very comfortable seating for watching TV, perhaps recliners, and additional upholstered pieces for entertaining. The only things that we own and would like to utilize are a small grandfather clock, a 6-foot high four-panel Chinese screen and a 26-inch round, glass end table. My husband and I each have an office, so we have no need for a desk. I want it to be attractive, but it must be functional. The room would be no problem to arrange if it weren't for the necessity of having a TV in a promiÂ­nent place. Do you have any ideas? A: There is no doubt that this is a difficult room to layout when you consider the available wall space and the prerequisite of a TV. You are correct that the only place to put an entertainment center to house your TV is on the long, unbroken wall. Many people would automaticalÂ­ly reserve that for a sofa or sectional, but you have no choice. With the placement of the TV established as a "given," I would flank it with two glass-enclosed wall units, which could be used for display. Combining all three pieces creates a functional, but attractive grouping. Two comfortable chairs that swivel, and an ottoman, would be angled in front of the railing, opposite the TV. I would choose these instead of recliners because they can be turned to face any part of the room, which would be convenient when entertaining. BeÂ­tween them I would place your round end table with a reading lamp on top. The chairs, angled as shown with the glass table, will not block the railing as would a large sofa. You still retain the feeling of spaciousness. To the left of the wall units, I would put a lightly scaled, occasional chair. .Next to it, I would place a small table with a standing lamp on the floor behind. On the other side of the wall units, I would angle a small sofa. The key here is to place a table with a lamp and your Chinese screen behind it. Doing this brings the sofa farther into the room and closer to the conversational grouping. It is important that the seating in any area not be placed uncomfortably far apartÂ light in the room, and the screen offsets the height of the wall units. Again, this arrangement does not interfere with the openness of the room. In front of the sofa, I would place an oval coffee table for conveÂ­nience while entertaining. In the small corner, between the step down from the foyer and the dining room, I would put your grandÂ­father's clock. It would be an ideal size and this makes perfect use of this out-of-the-way space.